This page describes a shoreline bluff that was created by glacial Lake Algonquin, perhaps 11,500 years ago. The shoreline bluff is exposed in the town of Point Clark, Ontario, adjacent to Lake Huron. Location: 44 degrees, 4 minutes and 27.94 seconds North; 81 degrees, 44 minutes and 37.42 seconds west. 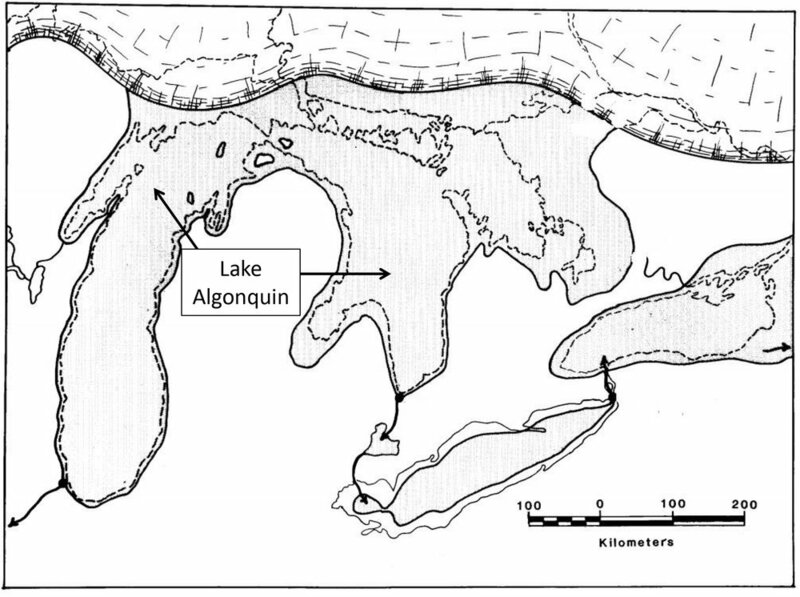 General outline of Lake Algonquin about 12,000 years ago in southern Ontario. Image from Royal Ontario Museum. There is an ancient shoreline visible in Point Clark, Ontario. The shoreline is marked by a steep cliff face, called a bluff. How odd. This shore line is located well away from the present shore of Lake Huron. How did this ancient shoreline form? What does it tell us about the past lake levels in the area? The answers lie in understanding the past climate, ice ages, and ancient lakes that are now long gone. Fortunately, those lakes left a sign for geologists to interpret. Several times in the past, thick sheets of glacial ice covered almost all of Canada (Figure 1). Geologists call this an ice age. The most recent ice age that affected North America started about 2.58 million years ago and ended about 11,000 years ago (in southern Ontario). This long period of time is called the Quaternary glaciation and is also known as the Pleistocene glaciation. This was the last great ice age. The Pleistocene glaciation was not one long period of time when ice covered the land. Rather, there were a series of glacial events separated by periods of time when the climate warmed and the glaciers melted back. The melting glaciers released enormous amounts of water, called glacial meltwater. The meltwater created great rivers, carved deep valleys into the land, and created very large lakes in areas dammed by remaining unmelted ice sheets. 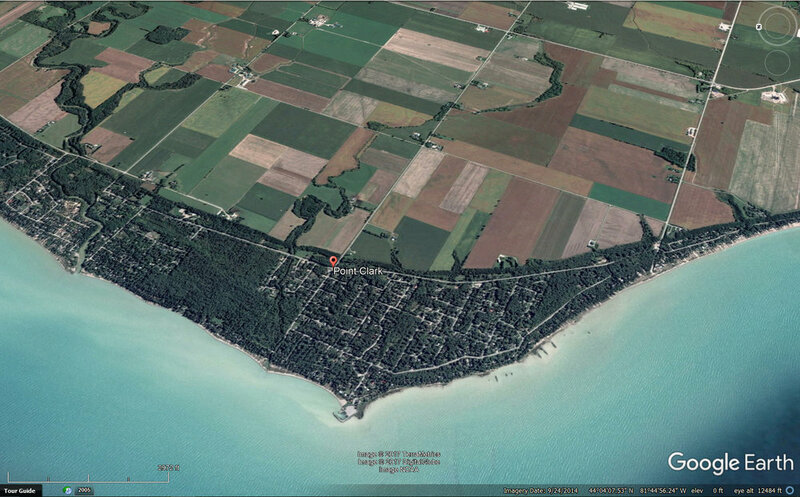 In this note, I will show you an ancient shoreline that is visible today in the town of Point Clark, on Lake Huron. That ancient shoreline marks the bluff created by one of the ancient lakes that formed when the glacial ice melted. The shoreline bluff formed adjacent to glacial Lake Algonquin, about 12,000 years ago. The ancient Lake Algonquin has long since disappeared and was replaced by its descendant, Lake Huron. But the story of Lake Algonquin remains, in part, preserved in the shoreline bluff. 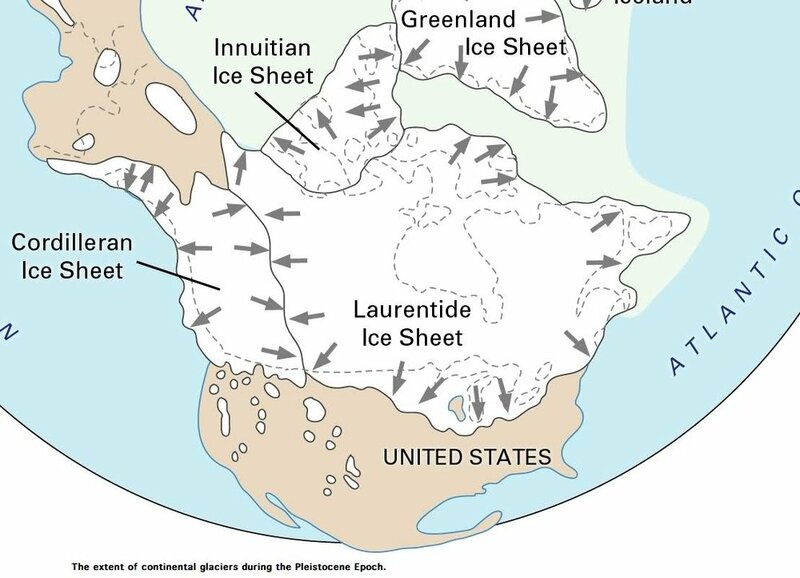 the Laurentide Ice Sheet covered central and eastern Canada and adjacent part of the United States. 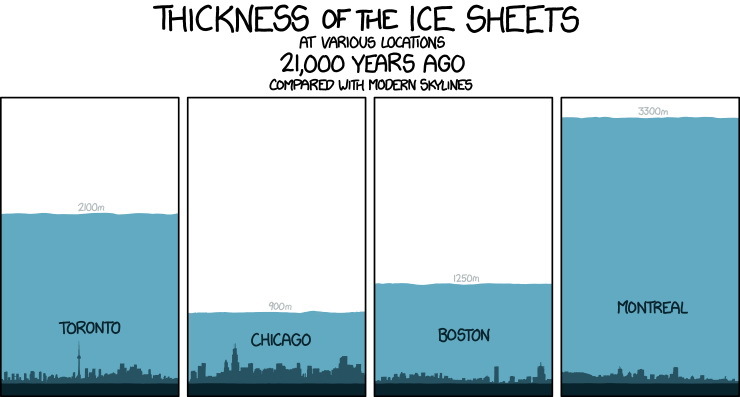 The maximum ice extent of the Laurentide Ice Sheet occurred approximately 25,000–21,000 years ago, when the ice sheet was up to 2 kilometres (km) thick (Figure 2). Figure 2: An illustration of the estimated thickness of the Laurentide Ice Sheet during the peak of the Wisconsin Glacial Episode. Image from: Scientific Gems. Starting about 15,000 years ago, the glaciers started to melt back in southern Ontario. An enormous amount of water was released and glacial lakes formed. These glacial lakes predated the present day Great Lakes. One glacial lake was called Lake Algonguin. Lake Algonquin started to form about 11,500 to 11,200 years ago. It is considered to have been the largest and latest proglacial lake to occupy the three upper Great Lakes (Figure 3). Figure 3: The approximate distribution of Lake Algonquin, from Curtis Larsen (1987): Geological History of Glacial Lake Algonquin and the Upper Great Lakes, U.S. Geological Survey Bulletin 1801, 39p. Lake Algonquin covered parts of what we now call Lake Huron, Georgian Bay, Lake Superior, Lake Michigan and inland parts of western Ontario and Michigan. At its peak, Lake Algonquin stood about 8 metres (26 feet) higher than present-day Lake Huron. A remnant of an old Lake Algonquin shoreline occurs in the form of a shoreline bluff (Figure 4), seen in the town of Point Clark, Ontario. Figure 4: This photo shows the old shoreline bluff created by glacial Lake Algonquin. The view is looking eastward in the Town of Point Clark: Location: 44 degrees, 4 minutes and 27.94 seconds North; 81 degrees, 44 minutes and 37.42 seconds west. Photo by Andy Fyon, August 28, 2017. A bluff forms when waves hit the land and remove material. This process is called erosion. Lake water currents move, sort (clean), and deposit the eroded material as beaches, and other deposits, further along the coast, down current from the source. Beach formation is much more complex. The Google Earth image (Figure 5) shows the bluff at Point Clark, looking easterly. Lake Huron lies in the front. The dark green vegetated area with the many houses and road network lies between present-day Lake Huron and the bluff. Figure 5: Google Earth image, looking east with Lake Huron in the foreground. The Lake Algonquin shoreline bluff is marked by the line that separates the green vegetated and developed cottage area from the farmland on the terrace above present day Lake Huron. The town of Point Clark sits on the old beach and other shoreline deposits between the present-day Lake Huron and the shoreline bluff. For those of you familiar with Lake Huron shore in this part of Ontario, the Algonquin shoreline bluff can be seen in other places between Port Elgin and Sarnia and east in the Lake Simcoe area. The shoreline of Lake Algonquin can be seen in other locations in western Ontario as well. Apart from learning our Ontario's geological past, knowing about the landforms and local geology guides land-use decisions. Beaches and bluffs are unstable and sensitive areas. They can be the habitat for unusual and specialized plants, animals and birds. Bluffs can become very unstable if de-vegetated. Land-use planning must take into account the local geology to avoid serious geological hazards, including landslides, and erosion of sensitive habitats. So, the next time you drive along the present-day shoreline of Lake Huron, consider the geological past when glaciers covered the land, glacial lakes formed and covered parts of the land, icebergs floated above your head, and ancient shoreline bluffs formed where waves from the very cold glacial meltwater lakes eroded and cut away the land. The Ontario Beneath Our Feet is not just about rocks born of fire - it includes exciting chapters about ice and water.